Want an insanely easy way to troubleshoot and report group policy settings for users and computers? Then you’ll love this guide. Having multiple group policy objects can get out of control and difficult to troubleshoot. So how exactly do you report what settings are getting applied? It’s easy just follow the steps in this guide. 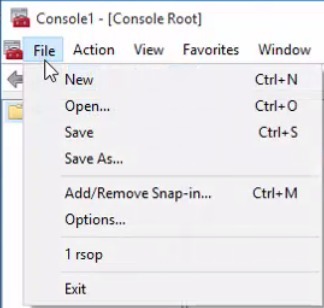 Bonus: I will also show you how to simulate group policy settings. It’s great for planning GPOs. RsoP (Resultant Set of Policy) is a Microsoft tool that is built into Windows 7 and later versions. It provides administrators a report on what group policy settings are getting applied to users and computers. It can also be used to simulate settings for planning purposes. RsoP is one of my favorite Active Directory Troubleshoot Tools for testing and troubleshooting group policy settings at the client level. RsoP (Resultant Set of Policy) has two modes, Logging Mode and Planning mode. This mode is used to generate a report on policy settings for users and computers. It is best used to verify and troubleshoot group policy settings. Administrators can use planning mode for “what if” scenarios. What if I move a user or computer to a different OU, what if I put a user in a different AD group, what if the user logs into a different computer. You can select various options with planning mode and it will simulate the policy settings. This was just a quick overview of RsoP (Resultant Set of Policy) for more details see Microsoft’s article What is Resultant Set of Policy. You must be a local administrator on the local computer for RsoP to return the computer configuration policy settings. Open the command line, type rsop.msc and hit enter. Rsop will run and generate a report for the user and computer policy settings. Now that RSoP has run its time to review the policy settings. 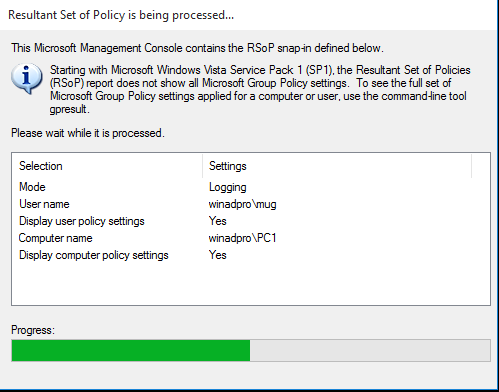 Keep in mind, RsoP will only show the policy settings, it will not show the group policy objects. 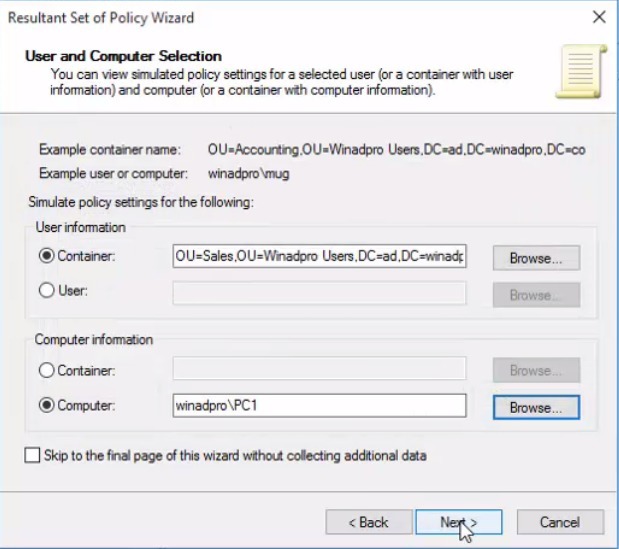 Browse through the policies to see what settings are applied. 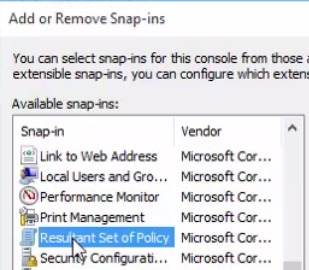 Now it’s time to go back to the Group Policy Management console and verify that the policies that you have linked are getting applied. I have a GPO called “Computer – Windows 10 Settings” that is applied to the Winadpro Computers OU. I’m logged into PC1 which is in the accounting folder. So, the policies in that GPO should get applied to PC1. Let’s verify that with RsoP results. 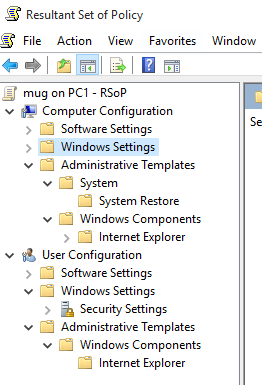 After running RsoP I can see that the settings in the “Computer – Browser Settings” GPO are getting applied to PC1. In the results, you can also see what GPO the settings are coming from by looking under the GPO name. I can see the Prevent running First Run Wizard setting is coming from the Computer – Browser Settings GPO. If you had multiple GPOs that have overlapping settings, you can look at the results and see which GPO is taking precedence. By default, when you run rsop.msc on a client machine it will run in logging mode. If you want to run in planning mode, follow the steps below. I’m going to use planning mode to see what policies would get applied if I moved a user to the Sales OU. I have a GPO linked to this OU so I’m expecting those policies will get applied. But before I move a bunch of people to this OU I want to test and see what really would get set. MMC can be opened by typing MMC in the windows run command or typing mmc.exe from command line. 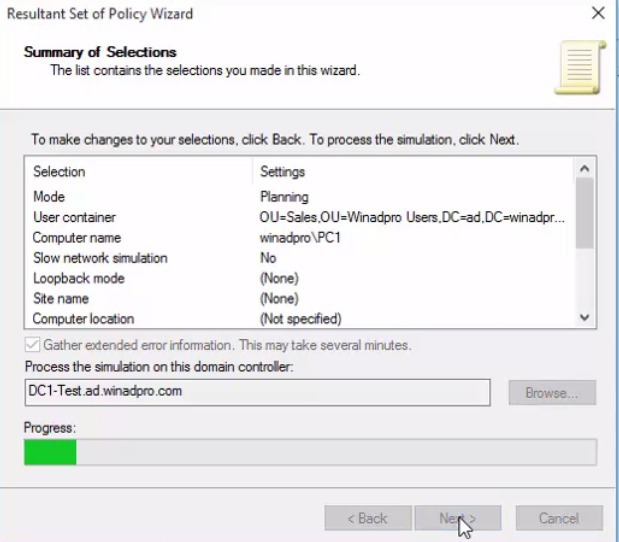 Select the User, Computer or OU that you want to simulate policy settings for. I want to simulate policies for the Sales OU so I’m going to select Container for the user information and then PC1 for the computer. Select any additional simulation options if desired. On the user security group page, you can simulate changes to the security groups. WMI Filters page, you can use all filters or only selected filters. Finally, the wizard is complete. So now I have the simulated results. I want to see what policies will get applied since I selected the sales OU. The results are only going to show what settings are applied. It will not show the GPO itself just the policy settings. Looking through the simulated results I can see that the screen saver settings are getting applied under the User Configuration. So, this confirms the GPO I set at the sales OU would get applied. I see no issues so I can move forward with moving users into this OU. I hope you found this article helpful. If you have any questions leave a comment below. Why would this happen the user is in the right group.But when the user log in the script for mapping the network drive challenge to enter credentials.once the user enter the credentials the network drives are mapped.But for very reboot or logoff the user is challenged for the credential for network share drives.This only happens fo 1 user in that group.